The World Baseball Classic had its first upset yesterday as Korea beat Japan 3-2 and, as the Lost Nomad reports, forced Japan's Ichiro Suzuki to eat crow. Lee Seung Yeop scored the game winner on a two-run homer in the 8th and will have a chance to show his stuff before MLB players and scouts in the second round. In the other happy news of the day, Taiwan beat China 12-3. Why is this a surprise? Japan hasn't defeated Korea in the international matches since 90's. There are more Korean MLB pitchers than Japanese. A good pitcher can neutralize a good hitter. Ichiro, like Wade Boggs of Red Sox, is a slapper-hitter. All of his big mouth won't be enough to beat Korean team. He will need a good supporting cast from his team. And they did not deliver. World Baseball Classic starts today. The World Baseball Classic started today, with Korea winning the first game. The top two teams from each bracket advance to the next round. Most of the first round winners are easy to predict (although the Panama-Puerto Rico should be pretty tough). After that it gets more interesting. The safe money is on a Cuba-US final but baseball has got to be one of the most unpredictable sports out there, so almost anything can happen. As I have said before, the Daily Kos is one of my favorite liberal parody sites, right up there with Blame Bush. What? It is not a parody site? Anyway, I generally do not get too worked up about the stuff they post there. Liberals will be liberals and they are often pretty funny. It's not getting a lot of buzz, but I'm excited about the World Baseball Classic March 3 through March 20. I haven't decided who to root for yet which I think makes it fun. Probably the Dominicans or Puerto Ricans. Uh, how about rooting for the Americans? Well, it seems that Nakao Yoshihiro decided to take a a page out of Flair's book and steal a little kiss of his own at K-1's Dynamite promotion in Osaka last Saturday. The problem was that Nakao didn't seem to know that Flair stole his kisses from women. Apparently a little confused during the pre-fight stare-down, Nakao gave his opponent Heath Herring a nice little peck on the lips. Anyway, at the stare down, the referee was mentioning the rules to both fighters. Then for some reason Nakao decided to kiss Herring on the lips. Herring reacted by punching Nakao with a right hook, but not close to full power. However, it appeared to shake Nakao’s brain pretty bad. Pretty bad indeed. They had to take him out on a stretcher. The Marmot has the goods on tape. It happens pretty quickly but you can see the kiss and Herring giving a 'no you didn't' look. To add insult to injury, Nakao taunts Herring by puckering up again, which results in Herring coldcocking him. Suddenly, a bunch of guys just attacked Heath and his corner. Read the rest to see how it turned out. 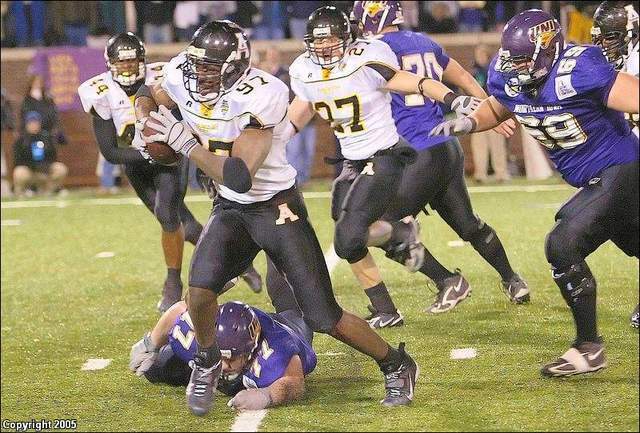 Appalachian State nose tackle Jason Hunter takes a fumble in for the championship-winning touchdown. My undergrad alma mater, Appalachian State University won the national 1-AA football championship last weekend for the first time. The winning touchdown was scored by the defense (nose tackle Jason Hunter running back a fumble). That makes sense because the typical offensive series for ASU over the last 15 years has been; run up the middle, option to the short side, desperation pass, punt. For a look at another studly nose tackle, check #91 in this picture. I can't describe to you how great the atmosphere was there. There were 21,000 people, 15,000 of which were ASU fans. It was loud all night long. I rushed the field after the game, got hugs from all kinds of strangers, and even from the man - Jason Hunter. The stadium literally shook on Hunter's touchdown. As I told my buddy that went, my only regret is that you weren't there to witness it. Cool. I certainly would have been there if I lived in the States now. I fully expect the university and city to pay for a statue of Jason Hunter to go up right next to the statue of Daniel Boone. Jung Ui-jin, a K-1 commentator, predicts that Bonjasky will exploit Choi’s lack of speed and try to hit and run, aiming for a win by decision. Bonjasky could also try demolishing Choi from underneath by ceaselessly attacking Choi’s lower body, making Choi stoop forward and making his face vulnerable to high kicks. Choi Hong-man’s strategy will likely be about counter strikes, as he is relatively slower. Bojasky is relatively frail against continued heavy blows. A timely knee kick from Choi could deliver a critical hit. Choi’s chance at winning depends on effectively keeping Bonjasky in a corner and not allowing too many kicks. Choi has been focusing his training on boxing style blows in order to complement his kicks. I am predicting that Bonjasky will take the decision. If Choi does manage to win, his legs will be too banged up to get to the finals. The good news for Choi is that he is still young (only 25) and will have several more years to develop his technique. Yesterday was pretty rough for Korea's national kibun as many of their best fighters went down against international competitors in two K-1 events in Seoul. In the first event (Korea Max), Koreans lost four of five matches against international competitors. The one Korean winner was also the feel-good story of the day. Choi Jae-sik beat his opponent with a first round knockout. The cool thing is that he did it despite missing his right arm from just below the elbow (pictorial evidence here). Despite that disadvantage, the dude can fight. He missed a roundhouse kick and went strait into a spinning backhand that hit the other guy square in the face, knocking him out. Needless to say, the crowd went wild. The other feel-good part of the evening were the ring card girls. The evenings events at Hero's when a little better with Koreans going winning three matches and losing five against international competition. Bob Sapp won his match in 8 seconds, which must be some kind of record. Please note that I am not saying that there is anything thing wrong with the Korean fighters. With the possible exceptions of Japan, Holland, Russia and the USA, there are few countries that could host an 'us against the world' event and do well. Perhaps a less nationalistic theme would have been more appropriate. Guys who like to see other guys beat each other up are in for a treat this weekend. K-1 is sponsoring not one, but two events in Seoul tomorrow. It is being bill as 'Korea vs World' (Do I really have to say 'sic' after Konglish?). The first event, Korea Max, starts at 1:00 and features kickboxing. It features 9 matches, 4 between two Koreans and five between Koreans and foreigners. The second event is called Hero's. It has 12 mixed martial arts (MMA) fights, 11 of which are listed here. The main event will be Bob Sapp against Korean 김종왕. Sapp is best known in Korea as the guy who lost a slow but brutal fight with Choi Hong-man last September. The first five fights will feature Koreans fighting Japanese. If that doesn't get the crowd worked up into a frothy nationalistic fervor, I don't know what will. And if you were wondering, yes there will be round card girls. [A]fter Wie finished her round at 74, she was escorted by two rules officials to the par-5 seventh hole at Bighorn Golf Club to show them her drop from a desert bush the day before. Nearly two hours later, she was disqualified for signing an incorrect scorecard, a decision that cost her $53,126 in prize money. Because she dropped the ball closer to the hole -- by 3 inches according to her, by about a foot according to the rules officials -- she should have added two strokes to her third-round 71. Wie hit a 5-wood into a Gold Lantana bush Saturday and was barely able to find it. She told her playing partner, Grace Park, she was taking an unplayable lie, dropped away from the bush, then chipped to 15 feet and made the par. It was a critical par save, and Wie steadied herself to get within five shots of the lead going into the last round. Michael Bamberger, a reporter for Sports Illustrated, told tour officials Sunday afternoon that he was concerned about the drop. Rules officials Jim Haley and Robert O. Smith reviewed tape from NBC Sports before taking Wie and caddie Greg Johnston to the seventh green after the tournament ended Sunday. `If I had to make the ruling based on the videotape, to me it was inconclusive,' Smith said. He had Johnston and Wie show him where the ball was in the bushes, then where they dropped. They paced it off, then used string to measure the distance and determined it to be slightly closer. Choi is set to fight with the Dutch defending champion at the first round of the K-1 World Grand Prix Final 2005 on Nov. 19 in Tokyo, Japan, and plans to eat recuperating mountain ginseng (sansam) and antlers of the deer (nokyong) until the day of the duel to improve his stamina. According to aides to Choi, the 25-year-old fighter dubbed ``techno-goliath’’ on Sunday visited a herb clinic located in Chamsil, southern Seoul, where he was diagnosed with excessive sweating. ``The examination shows few bad symptoms in Choi’s health condition, but he was found to sweat a lot,’’ Oh Jong-cheol, a doctor of the clinic, was quoted as saying by Yonhap News Agency. ``The symptom appears when a person works out too much or lacks stamina. As Choi will represent Korea in K-1 and will have an important bout next month, I gave him herb medicine of mountain ginseng and antlers of the deer that he can take for a month,’’ he said. Its a good thing the fight isn't in summer, or Choi might have also felt the need to munch on man's best friend to beat the heat. BTW, having had both traditional Korean medicine and boshintang (and believing in the effectiveness of the former), I would not belittle the benefits that Choi make get from his new health regimen.